DB2 is a proven database for handling the most demanding transactional workloads. But the trend as of late is to enable relational databases to handle analytic queries more efficiently by adding an inmemory column store alongside to aggregate data and provide faster results. IBM's BLU Acceleration technology does exactly that. While BLU isn't brand new, the ability to spread the column store across a massively parallel processing (MPP) cluster of up to 1,000 nodes is a new addition to the technology. 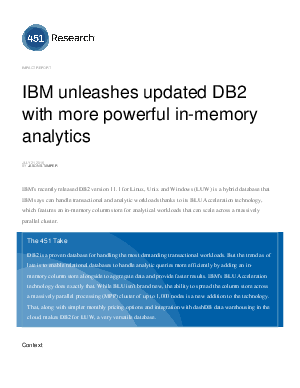 That, along with simpler monthly pricing options and integration with dash DB data warehousing in the cloud, makes DB2 for LUW, a very versatile database.